Last week the 9th LIGHT workshop took place at Ringberg Castle (right). In the wonderful surroundings of a sunny autumnal Tegernsee region we had lively discussions on the latest photosensor developments. Participants from both, science and industry, shared their previous progress and their ideas for future developments. On Wednesday we presented the SENSE project on top of Mount Wendelstein. Beside a short presentation on the project's management and the results from the SiPM measurements we introduced and discussed in this summit session the roadmap for the ultimate LLL sensors. On Wednesday afternoon, September 13th, Katharina Henjes-Kunst had the opportunity to present the SENSE project and its latest news to the participants of the Mount Elbrus Conference: from Deep Underground up to the Sky. The conference took place from September 11th to 15th and is continuing the series of APPEC-Russia events that started in 2016 with the Lake Baikal Three Messenger Conference. This year the conference was held close to the Baksan Neutrino Observatory, a unique complex of surface and underground experimental facilities, to feature its 50th anniversary in 2017. SENSE was at the 8th New Developments in Photodectection (NDIP) conference in Tours, France. The 8th NDIP international conference gathered about 240 physicist, engineers, technicians and students working in instrumentation for photodetection. NDIP covers different types of detectors – from solid state, vacuum, gaseous, organic detectors or new sensing media in many applications fields (nuclear physics, particle physics, astroparticles, astronomy and astrophysics, beam line diagnostics, synchrotron radiations and free electron laser instrumentation, medical and biology, societal applications). 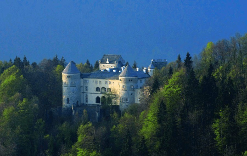 SENSE financially supports the LIGHT-17 workshop at Ringberg Castle, Bavaria, Germany taking place from 16 – 20 October 2017. LIGHT-17 is the 9th in a series of workshops on Photosensor Developments for High Energy and Astro-Particle Physics. Leading specialists from High Energy and Astro-Particle physics and selected industrial partners are invited to this workshop, discussing the very frontier developments on low-light-level (LLL) fast photon sensors and the future trends. One session of this workshop will be devoted to SENSE. There the roadmap towards the ultimate Low Light-Level Sensor developed by the SENSE Consortium and the Expert Group will be presented. In March 2017 our colleagues from the University of Geneva presented SENSE at the TecDay at college Rousseau within a module on “The messengers of the Universe”. TecDays is an initiative of the SATW (Schweizerische Akademie der Technischen Wissenschaften) to promote technical understanding and stimulate curiosity about technical and scientific training at secondary schools all over Switzerland. In different modules the fascination of technology and science is made accessible for young people. The modules are presented by individuals from industry, universities and research institutes and within 90 minutes an interactive presentation of their working field is offered to the students.